Civil unions, gay marriage, Democratic debate, oh my! The Human Rights Campaign and MTV Network’s Logo channel will be hosting a Democratic debate Thursday, August 9 at 9pm to discuss LGBT issues. The hot topic? Gay marriage, duh. This debate is historic, so it would be a good idea to watch it. If you don’t have Logo or are a poor college student without cable, you can watch online. My guess is that one or two of the candidates will fall flat on their face tonight, except for Hillary, who will come out on top as usual. 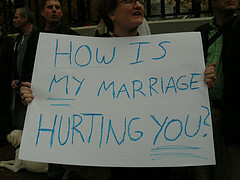 FactCheck.org has a great overview of the issues involved with the gay marriage debate.